If you have never traveled to Thailand you may be wondering if it will leave up to its hype. As Asia Pacific’s most popular tourist destination Thailand receives millions of tourists annually and many I bet would love to go back again. 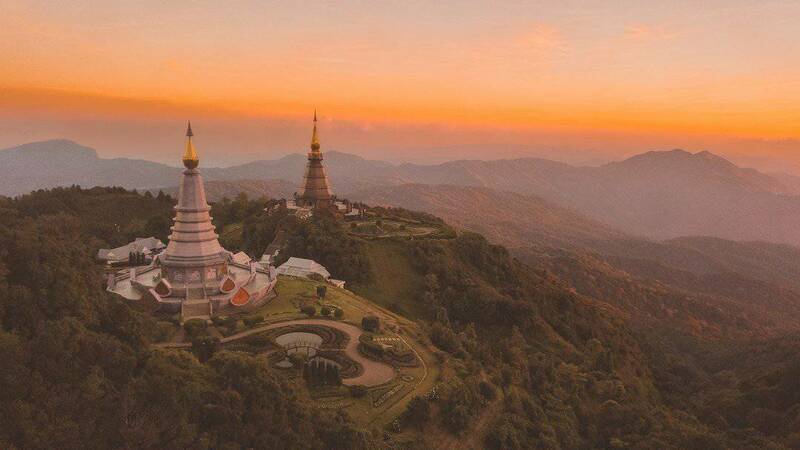 As a first time travel knowing the best and most impressive places to visit will make you better spend your time, enjoy your trip and hopefully plan to travel to Thailand again. That's why we came up with this list of places to visit in Thailand for you to get the most of it. From gorgeous beaches, national parks, temples, energetic cities Thailand has something for everyone. Without further delay, here are some of the "Land of Smiles" destinations and activities to add to your travel itinerary. These attractions are located in Bangkok along the Chao Phraya River. Constructed in the 1800s the Grand Palace is one of the worlds most frequented attractions receiving close to 8 million visitors annually. While the palace was built for the Thailand royal family none has lived there since 1925 and it now serves only as a tourist hot spot. The Wat Phra Kaew which is next to the Grand Palace is a stunning temple also known as the Temple of the Emerald. The beauty of these two attractions will blow you away. staircase with over 300 steps. Looking to party in Thailand then make a plan to attend the full moon party, one of the largest beach parties in Thailand and Southeast Asia. Held every month in the island of Koh Phangan on Haad Rin Beach this party had over 30,000 foreign tourists during the last event in December 2018. Characterized by lots of booze, fireworks, live DJ's and tourists in bikinis this party goes on till early morning. It a must attend if you want to experience Thailand’s nightlife. If you only plan to spend time on the beach while in Thailand then Railay Bay will be the perfect destination for you. This island has four pristine beaches the most popular being Phra Nang Beach. The beach has a very lead back vibe and a few days here will leave you not wanting to ever go back home. The only way to the beaches on Railay Bay is by boat as they are no roads there. Apart from chilling on the beach you can try rock climbing, do some kayaking, hike, get massages, have drinks as you watch the sunset and more. Boxing is big in Thailand and you shouldn’t leave the kingdom without watching a Muay Thai fight. The New Lumpinee Boxing Stadium in Bangkok has regular fights during the week and you can make your way there to watch a fight. If you’re looking for a unique shopping experience travel to Bangkok's floating markets. 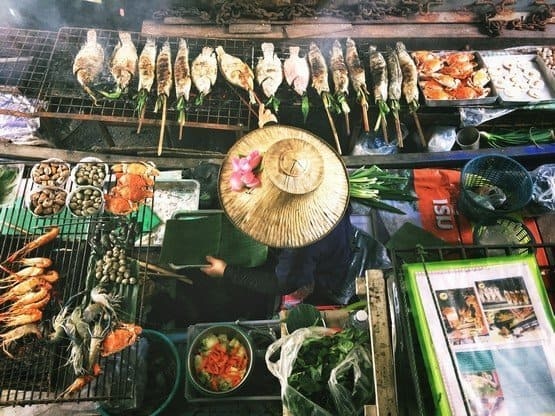 These markets are full of boats on water ways selling everything from tasty Thai food to souvenirs. 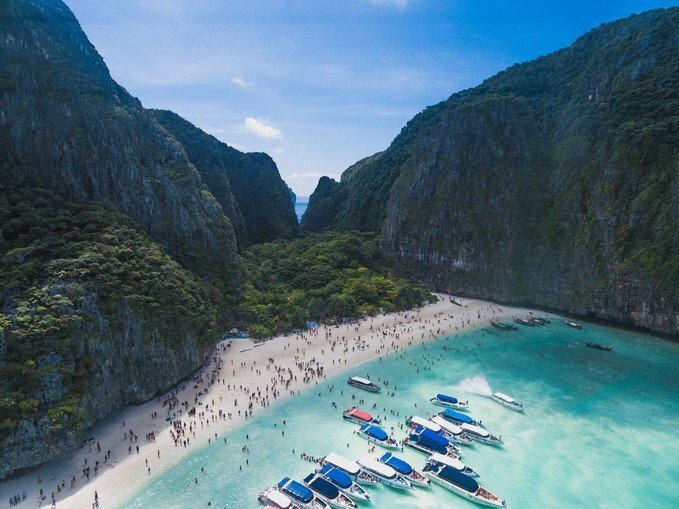 This beach is in Koh Phi Phi and was made famous by Leonard DiCaprio’s movie The Beach released in 2000. The secluded beach has received numerous visitors since then who are keen to explore it as DiCaprio did. Currently, the white sandy beach has been closed for rejuvenation program aimed at installing additional jetties and reviving its decimated coral. When planning your trip to Thailand be sure to check if it is open it would be a perfect place to unwind. If you want to do all your shopping in one place check out this market. 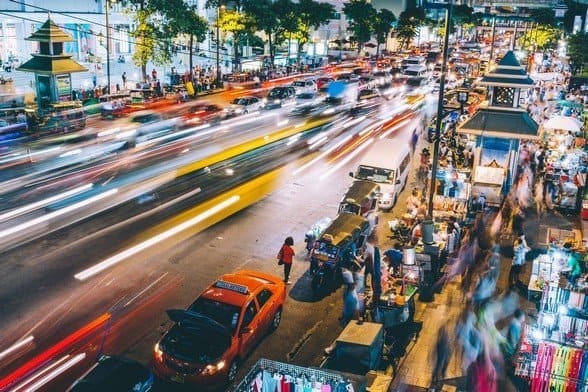 This market in Bangkok is one of the largest Asia and you can find just about anything you think at Chatuchak weekend market. While at the market be sure to bargain before making any purchases. This park declared a World Heritage Site by UNESCO is frequented by tourist because of its close proximity to Bangkok and beauty. It has challenging hiking trails and is abundant with wildlife and would be a pleasure to visit. Want to get up close with an elephant visit one of the many elephant sanctuaries found across Thailand to do so. However, research about any elephant sanctuary before visiting it to ensure that elephants there is well-taken care of. Some sanctuaries mistreat these animals for profit an act which should not be encouraged. I highly recommend you head to santuaries that do not require such large amount of fee or better, those shelter that are operating based on donations. The higher the "volunteer fee" the more sketchy the place is. As you can see Thailand has a lot to offer and you are unlikely to be disappointed when you visit the country. To travel to the country you will need a valid passport and apply for a Thailand visa on arrival online. Wherever your travels take you to hope you enjoy the time spent on Holiday.